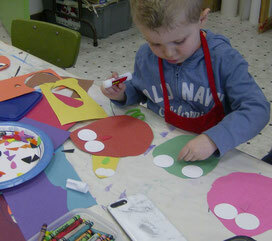 This art class is designed just for young children ages 4 to 5 who love to create! Each 4-week session includes hands-on, open-ended, age appropriate art experiences that will help your child develop valuable skills in art appreciation, decision-making, goal-setting, fine muscle skills, respect for others, and self esteem. Most importantly, they'll have a great time making ART! Projects and activities include a variety of media beyond crayons, including watercolor, temperas, pastels, collage, ink, sculpture, and mixed media. We strive to provide hands-on opportunities for young children to create while experimenting with tools, materials, and imaginations. Artwork is always open-ended, without expected or specific outcomes or results. See more about open-ended art methods for teaching young children here. A one-hour art class just for young children ages 4 to 5 who love to create! Look for Spring and Easter-themed art projects this session. A one-hour art class just for young children ages 4 to 5 who love to create! Look for a Mother's Day surprise plus lots of fun, process-based art projects this session. A one-hour art class just for young children ages 4 to 5 who love to create! Look for lots of exciting, hands-on, process art projects this session!